The all-new 2015 Stingray 192SC lands on the outboard deckboat bull’s-eye. 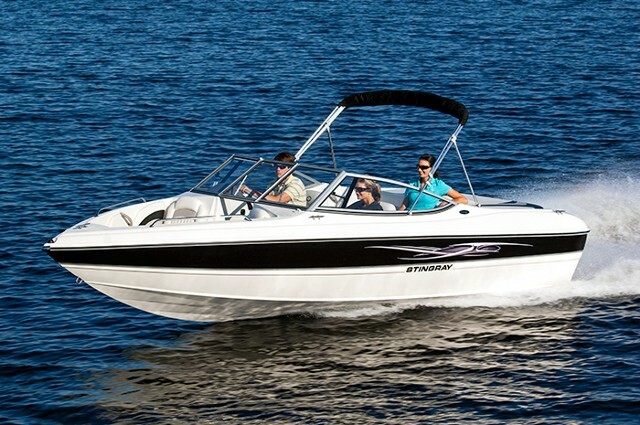 One common trait among Stingray’s new model introductions is is that they make sense immediately. They should, of course, but that doesn’t always happen in the marine industry. 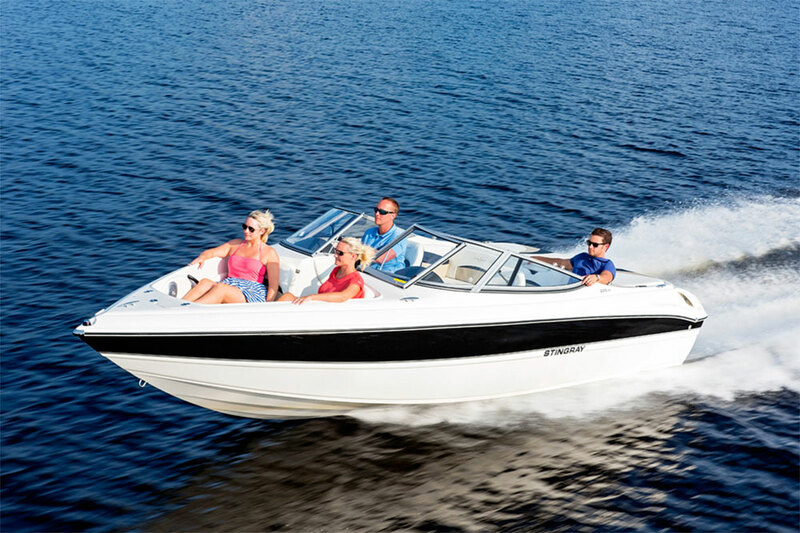 Sometimes you’ll come upon a new model from one manufacturer or another and scratch your head about who the boat is for or how it fits in the company’s lineup. 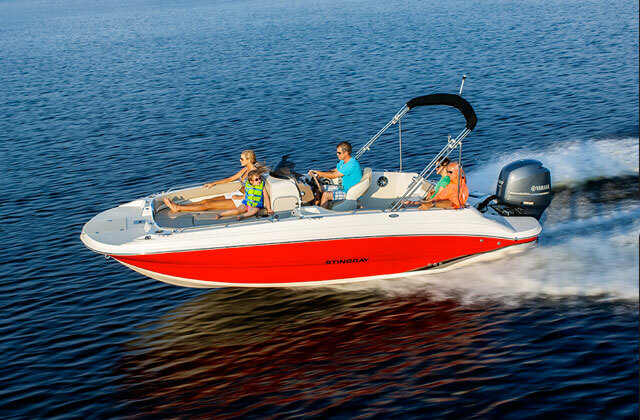 The Stingray 192SC is small enough to handle easily, but has plenty of room for the family. 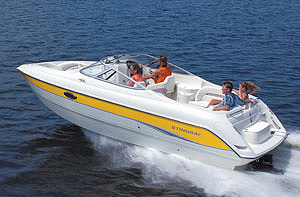 In the case of the 192SC, the boat makes perfect sense. Coming on the heels of its larger stable mate, the 212SC, the 192SC covers a lot of ground in its manageable 20-foot length. At that size, the 192SC is small enough to fit in most garages and it’s 8’ 4” beam means you might still have room left for a car—or a bunch of boxes full of useless things you haven’t touched in years. And at 2,600 pounds, the 192SC can be towed by even small SUVs, which means you don’t have to upgrade your tow vehicle when you get a new boat. 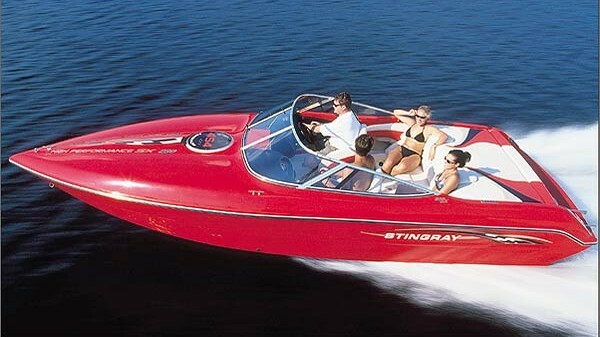 The nice thing about the 192SC is that it shows Stingray knows a thing or two about how people actually use boats and why they buy deck boats. 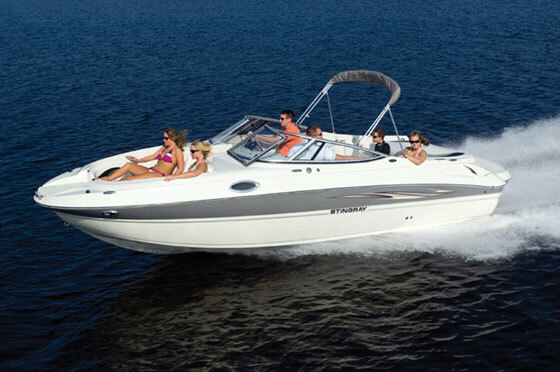 For example, there’s ample floor space and excellent ingress from the bow, stern or port side. The spacious platforms fore and aft let you board with ease as does the port side steps down from the gunwale. Telescoping ladders at the bow and stern allow for easy access to the water. Added steps for boarding from the side - nice touch, Stingray. In terms of standard features, Stingray does a good job of providing value for the money. It comes with a “convenience package” at no extra charge, which has some nice features. 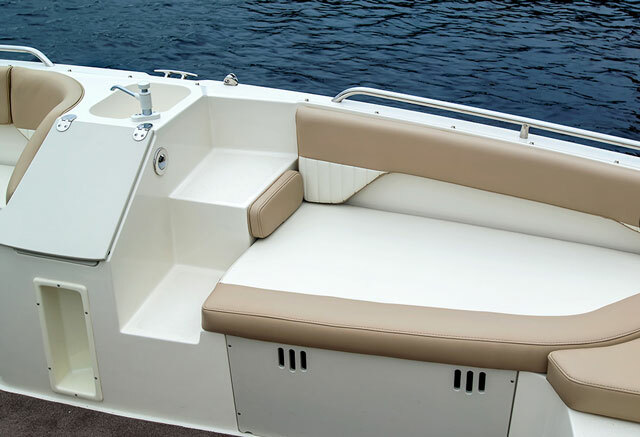 Including a bilge pump in a convenience package is a bit of a stretch, but adding a Bimini top with quick-connect stainless-steel fittings is not. Every boat should come standard with a Bimini top, yet not all boat builders include it. The convenience package also includes a 25-quart Igloo cooler, a freshwater sink, indirect LED cockpit lighting, an hour meter, an Italian steering wheel, and a 12-volt power outlet. Base MSRP is $34,326, but there are a few options that are probably worth looking into. For starters, the $608 colored hull-sides. It’s a much better-looking boat with a little color. Choose from blue, black, latte, crimson and red. If you get a hull color other than latte, you’ll also need to spend $146 to get matching canvas. 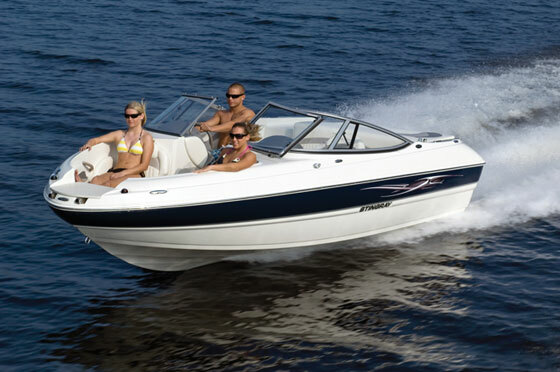 For power, the 115-horsepower Mercury is enough to push the 192SC to a top speed of 40.2 mph. If you value speed, it might be worth the $3,550 to get the 150-horse Mercury outboard, which gets you 10 more mph of top-end, 50.3 to be exact—and Stingray goes to great lengths in measuring the performance of its boats exactly. Even with all those options boxes checked, you still can park a 192SC in your garage for less than 40 grand—and that’s something that also immediately makes sense. 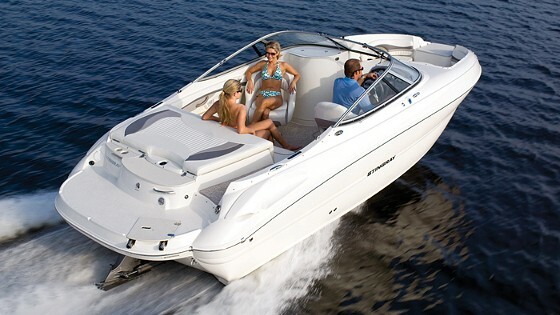 Other Choices: The Sea Ray 19 SPX, available in both outboard and stern drive models, will compete with this boat. 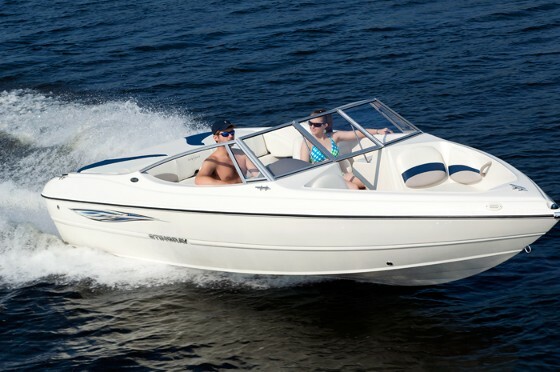 If you want to spend a bit less the Bayliner 190 DB is a possibility, and if you want a boat that’s a little snazzier, you might look at the Hurricane Crossfire 203. For more information, visit Stingray.